This is not in Naples and not even in Campania, but it’s close, and if you don’t know about it, you should. The last town in the Campania region of Italy as you move south along the beautiful Tyrrhenian coast and the mountains of the Cilento national park is Sapri. Just beyond, in the Basilicata region, is the town of Maratea; it is nestled on the hillside below Mt. San Biagio, overlooking the Gulf of Policastro. 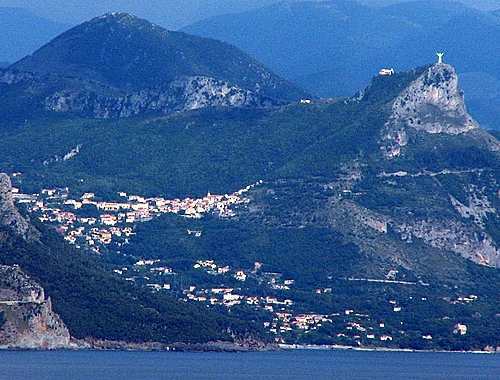 Overlooking Maratea, however, from the 640-meter (1900 ft.) height of Mt. San Biagio, itself, is a remarkable piece of sculpture —Christ the Redeemer (top right in the above photo). In 1941 a simple large cross was put up on the mountain as a war memorial. It stayed there for 20 years. In 1963 that cross was moved to another location near the old center of Maratea so that construction could begin on the statue of Christ. Count Stefano Rivetti di Valcervo proposed the statue and then sponsored the construction. The statue was designed by Bruno Innocenti (1906-1996) of the Institute of Fine Arts in Florence. As an artist, Innocenti was a realist and known for his delicate renderings of the female form; thus, he was out of step with the great wave of the avant-garde in Europe and really out of step with the muscle-bound hulks of Fascist realism that surrounded him as a young man. Some of his work decorates theaters such as the Teatro Comunale in Florence and the Rome Opera. Most of his works were portable and are displayed indoors. The vast open-air stage in the mountains above Maratea is a glorious exception. The Redeemer was finished in 1965. 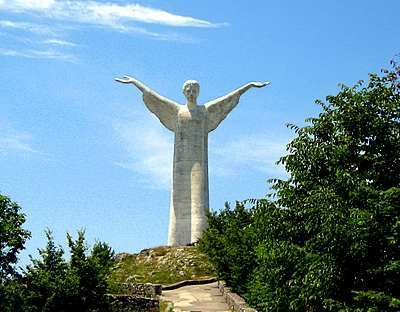 The statue is made of concrete with a facing of white Carrera marble and stands 22 meters/72 feet high. By virtue of spectacular location, subject matter and size, the statue of the Redeemer in Maratea is reminiscent of the statue that “everyone knows” —the Redeemer atop Mt. Corcovado in Rio De Janeiro. Stylistically, however, even the casual observer will notice differences —the different position of the arms and hands, for example. The Redeemer of Corcovado is in the shape of a perfect cross; indeed, from a distance, the sculpture could be mistaken for a simple cross. The palms of the Corcovado Redeemer face forward. The Redeemer of Maratea has arms upraised almost to a 45-degree angle; the palms face up, and the figure itself is robed with one side of the bottom section set slightly ahead of the other, as if the Redeemer were stepping forward. (That would be perfectly in keeping with the original name of the work, as reported when Innocenti was still working on it: Il Cristo risorgente—Christ Rising, referring to the moment of Resurrection.) The Corcovado Christ is bearded; it is traditional and borders on the somber; the Maratea statue is youthfully —even “angelically” (according to my wife)— androgynous and joyful. Others may accept that interpretation as they wish. (May 2013) added photo directly above: The image is from a 1965 copy of Oggi magazine. 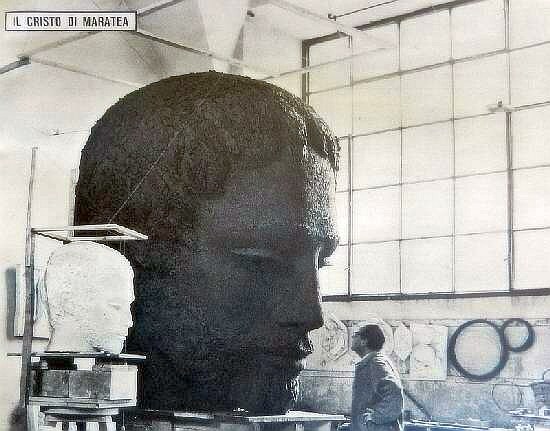 It shows the sculptor Bruno Innocenti at work on the unfinished Christ the Redeemer (also known as Christ Rising, or The Christ of Maratea).